o'right | eco-friendly products & inspired by nature! a professional haircare brand which results in a balanced interaction between the human being and the environment! apivita | the power of greek nature and beekeeping! a brand with a strong philosophy, social responsibility; and values which have been preserved for more than 40 years! meet the best products by isdin for pregnants, mothers and babies! know more about isdin woman and nutraisdin. babé laboratories | cosmetics for all ages! simple and safe formulations, with a clear goal: to rebalance your skin, so that you always feel good! meet favorite products from make up artists and used by actresses and hollywood stars. gift guide for valentine's day! do you already know what offer at the most romantic day of the year? we can help. meet our gift guide for her and for him. blue light| friend or foe? while on the one hand there are more and more products dedicated to counteract the harmful effects of blue light; currently there are also devices that use this portion of visible light to our advantage. january is a month of new beginnings, so it's also the perfect time to refresh your beauty routine! we make sure that our customers are the first to know all the new products in our store! today we decided to talk to you about the anti-aging care of a brand with decades of history. christmas is around the corner! but if you still have gifts to buy, we leave some ideas that can help you in this difficult task. we received at sweetcare a very special visit that we have not yet had opportunity to share with you. 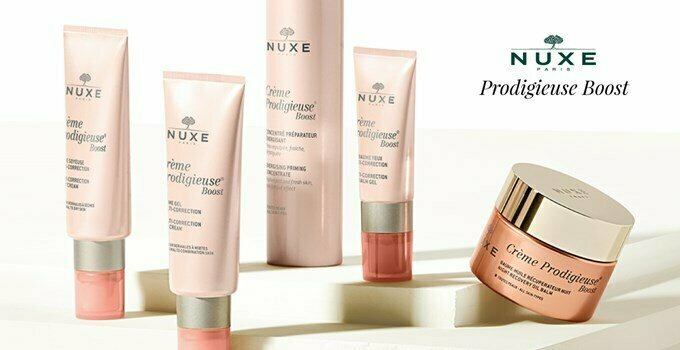 crème prodigieuse boost | the first anti-ageing nuxe range! multi-correction skicare that stimulates skin natural mechanisms; making it look fresher, brighter and smoother!